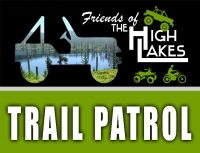 We have started a volunteer trail ambassador program for The High Lakes area. This group is volunteer initiated, now having been fully authorized by written agreement with USFS, we are official, and have shirts, hats, and we've licensed most members as Amatuer Radio (ham radio) operators. We are able to hit many repeaters, especially our own repeater. Your ideas would be appreciated. We must curtail the misbehaving that gives our sport a bad image. I'm even thinking that posting the offenders to a world wide web site would be one way to shed some light on their behavior. Join us at 4x4 Trail Finders BBS to kick this around. Here's what to do if you observe trail abuse or law breaking going on: The High Lakes Trail Ambassador program STARTS NOW! Report violators and outlaws to our Trail Ambassador Captains. Friends of The High Lakes will pursue and follow up with the appropriate law enforcement channels. Some cases have already been successful. FOTHL tracked down the violators and we pursued the follow up with law agencies involved. It does work! We need YOU to be able to identify the driver if at all possible. YOU need to ask him/her to quit what they're doing (nicely if you feel comfortable doing it). But BE A WITNESS. Get their vehicle plate, vehicle ID as best you can. Keep a note on the description of where, what, etc. Take digi pictures. And get other witnesses if you can. Send this info to us via email and we will stay on top of it and try to get corrective action. AND we'll publish the event (whatever is public knowledge) and who was out there trying to get our trail closed by being stupid and not listening. 1. OBSERVE: - Fully assess the situation. Figure out what laws or ethical behaviors are being violated and how it impacts the future of our trail. 2. EDUCATE: Ask them to stop and explain why -- educate them as best you can without getting confrontational. Carry some Tread Lightly! brochures and hand them out. Carry FOTHL brochures, spill kits, and personal hygiene kits and hand them out. DO NOT get into a mix-it-up. Back off and just get the facts if the folks you are dealing with are fully felony stupid and might get physical. 3. IDENTIFY: Identify the event and driver/rig -- try to see and remember the driver's face. You may have to be able to literally pick out the driver from a line-up-type siutation. So remember what he/she looks like. Take pictures that include the driver, the rig, the activity and the license plate. Get a witness who can corroborate your report. 4. REPORT: Report it! -- to us, or if handy for you, the USFS Law Enforcement Officer, Plumas County Sheriff or District Ranger. Be willing to stand up and be a witness if needed. NOTE: State peace officers normally need to witness an event to take citation action. Federal officers need not witness it for federal citations. But either way, we need a good report and stand up witnesses. We can work with our law enforcement partners to determine whether the case should go the Sheriff, the USDA Forest Service, or both. With your help, we will blast the names and photos (if you get one) of really bad violators ALL OVER THE INTERNET, as well as to law enforcement authorities. We will pursue it until motorized outlaws get the message that they're ruining it for all of us (and perhaps be responsible for closing our trail). Trail Ambassador members will be assisting law enforcement folks in several ways besides just our educational efforts. We might be used to carry gear for them in our rigs. We might assist with rides for them and their gear. We can help them with breakdowns and repairs. We can share lunch with them. We can back them up with our shear numbers in the event of any kind of loud or confrontational group that might be uncooperative. We will have a sign up system or notification system where we can coordinate our trail time with their trail time, so they know who's there to assist with Trail Ambassador duties on any given day. And also visit the Pirates4x4 Bulletin Board Land Use Forum for a place to chat about ideas for curbing motorized outlaws and improving our image. I've read all the law enforcement stuff here and I'm ready to apply.